Series D Lift Offers High Quality and Safety, Low Maintenance, Features Exclusive Dual-Pak Design. Guided Dual-Pak design has no cables, chains, bearings or other components that can break or require lubrication. Lifts loads up to 3,000 lbs. Carriage sizes to 6' x 6'. Vertical rise heights to 14'. 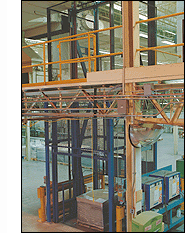 Ideal for mezzanine and balcony applications. Pressure-compensated control valve regulates flow of hydraulic oil to ensure smooth, constant lowering speed under any load. Ultra-high molecular weight polyethylene cylinder guide prevents cylinders from twisting during operation, improves cylinder life. Durable, high-quality construction ensures safe, reliable, long-term performance. 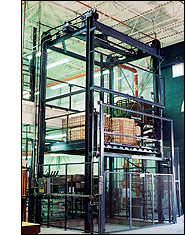 Series F Lift Offers Maximum Capacity, Rugged 4-Post Design For The Heaviest Lifting Applications. Lifts heavy, bulky, oversized loads up to 30,000 lbs. and more. Transports multiple pallet loads, large carts and heavy machinery between two or more levels. Offers maximum flexibility in carriage size, capacity and traffic patterns. Loading and unloading from all four sides. Engineered to meet your exact application requirements. Unlimited vertical rise. Travel speeds up to 400 fpm. Heavy-duty construction provides superior strength, reliability and long-term performance. Available with patented DeckLock system that provides additional security at critical upper levels. Meets ANSI/ASME B20.1 code. Series M Lift Series M Lift Offers High Performance And Durability With A Proven 2-Post Mechanical Design. 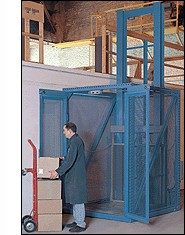 Designed to transport large, heavy loads between two or more levels. Ideal for high-cycle, automated systems or frequent-use applications. Lifts up to 8,000 lb. loads with carriage sizes up to 10' x 12'. Vertical rise to 200'. Travel speeds up to 400 fpm.